Hold on tight and experience the adrenaline rush of speeding through Floridian waters! Grab a few friends and hop on board for this Miami tubing adventure! 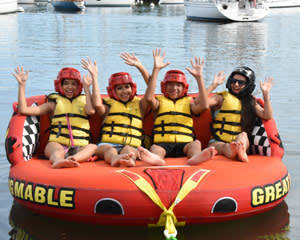 Fun for the whole family, tubing is an amazing activity that let’s you race across the waves and wake at rushing speeds. Your captain will get your adventure started with a brief instruction on hand signal communication for during the ride as well as basic rules to abide by to ensure you have a safe experience. Then it’s all aboard to tow out to the bay! You’ll enjoy a relaxing glide behind a 25 ft rigid Rib Craft where you can take in the sights of other thrill seekers and boaters alike as you make your way to open waters and pick up speed. And then you’re off for the ride of a lifetime! Enjoy the warm splash from tropical Atlantic waters as the wind rushes past. Book your Miami tubing adventure today!